If completed successfully Monday-Friday before 12:00 midnight, certificate will be posted next day. Weekend completers will have their certificates posted on Monday. We want you to be completely satisfied with your purchase. We offer a 30 day, no hassle, no quibble, money back guarantee if you are not 100% satisfied. *You must not complete the course or print your certificate in order to make a valid refund claim. Discounts are available for multiple purchases (10 or more) and are calculated during checkout. 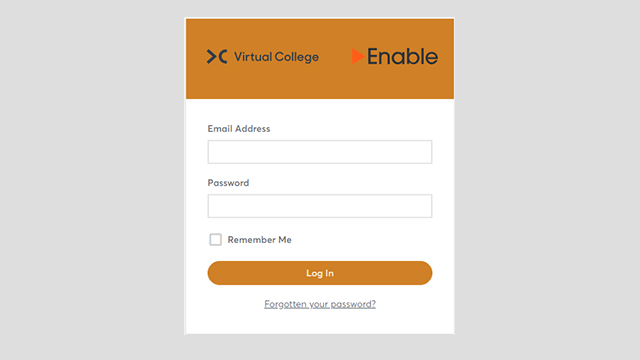 If you have 10 or more learners and want to track their progress or, for details of how we can help you with a corporate e-learning solution, please contact us. As a business owner or food handler, you have a duty to conform to the provisions of Regulation (EC) 852/2004 of the European Parliament on the Hygiene of Foodstuffs, the Food Safety Act 1990, and Food Hygiene (England) Regulations 2005. Supervisors are required to ensure that staff handling food or are involved in food preparation or storage are supervised accordingly and trained in food safety and food hygiene in a way that is appropriate to the work they do which enables staff to handle food hygienically and safely. 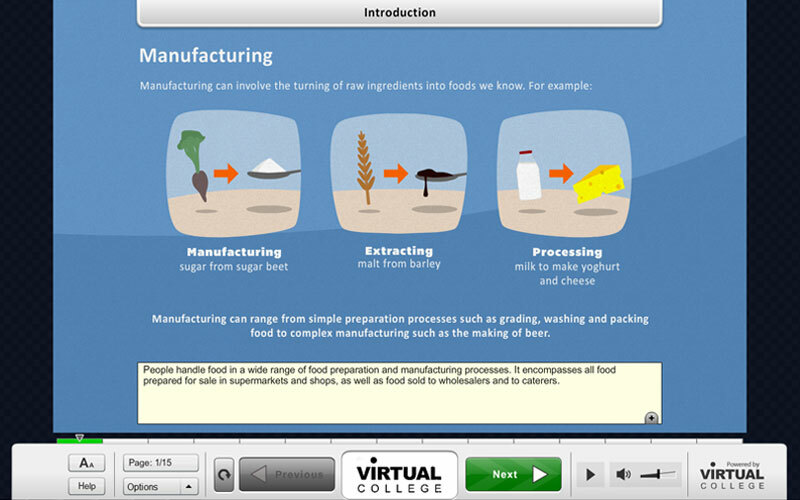 This online training course was designed for food supervisors who may be from catering, retail or manufacturing environments. This food safety course is designed to allow learners to understand and comply with their legal obligation for supervising the preparation, storing or even cooking of food to comply with food hygiene standards. Who needs a food hygiene certificate? 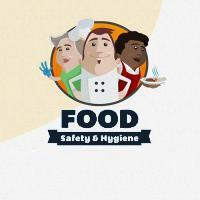 It is recommended that all food premises should have at least one person trained to Level 3 in Food Hygiene and Safety- particularly if they are in charge of other staff and are responsible for the training of those staff. 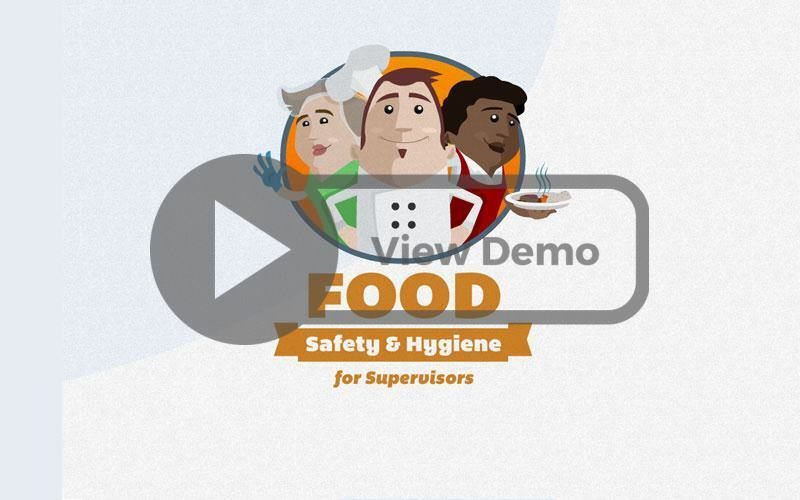 By completing this online training, individuals will benefit from a broad knowledge of food safety and hygiene in the workplace, with a focus on taking responsibility for food safety monitoring procedures and to identify food safety hazards. 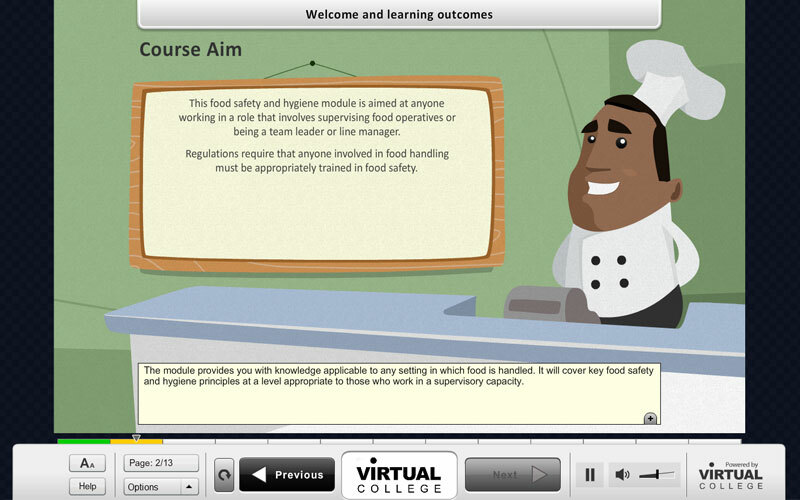 The food hygiene level 3 elearning course was produced in association with food safety experts “Food Dialog” and every effort has been made to make the training friendly, understandable and down to earth. 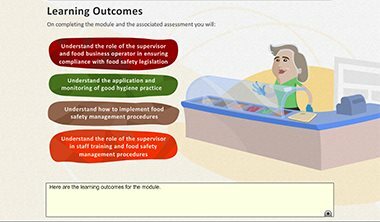 This self-study module maps to industry standards in food hygiene and food safety. Upon completion of this online food safety course, learners will sit a training test and upon successful completion of this module, will receive a City & Guilds Certificate in Food Hygiene and Safety for supervisors. As a recognised City and Guilds Accredited centre, our course content and our learner support systems are all City and Guilds approved quality assured, including our online delivery processes. Upon completion of our courses you will receive an official City and Guilds certified qualification for Level 3 Food Hygiene and Safety. Microbiology- Pathogenic bacteria, toxins and viruses are contaminants of food through microorganisms. This section covers the importance of thorough preparation and cooking of food to eliminate these viruses and bacteria. Food-borne illness- Looking at how we prevent food bourne illness and the impact of this from a personal and a legal responsibility. Understanding food law- Reflecting on legislation in place regarding food hygiene and food safety. 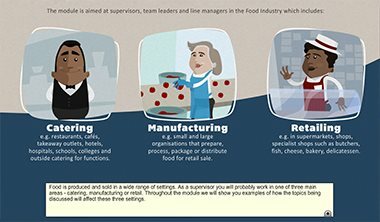 The role of the supervisor- Understanding what your role is in the supervision of food handlers when it comes to food safety and hygiene. 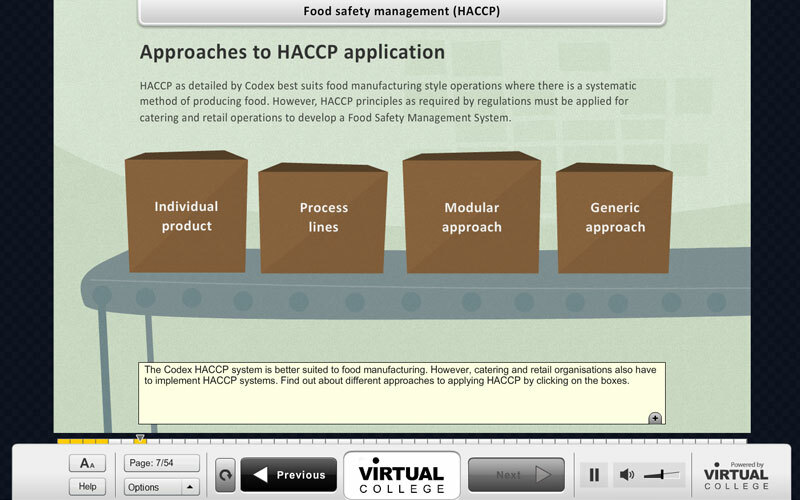 Food safety management (HACCP) - A Food Safety Management system is required from those responsible for development and maintenance of the HACCP system. This is for catering, retail and manufacturing. Food preservation – How to preserve food safely and hygienically. Food storage and temperature control - How to control contamination through safe temperatures and storage. Personal hygiene - From hand washing, health, first aid, protective clothing and appearance, this section will teach you how to ensure that your staff keep a good standard of personal hygiene when working with food. Cleaning and disinfection – Ensuring your workplace is hygienic and safe for food preparation, cooking or storage. Pest control – How to control and prevent pests and keep a safe and hygienic environment for food. Our Certificates are of extremely high quality and carry an authorisation seal. The certificate should be displayed to show appropriate training has taken place. If completed successfully before 12:00 midnight, your food safety and hygiene certificate will be posted the next working day. The training and test usually take approximately 8 hours to complete (depending on learning speed). This is equivalent to 16 hours face-to-face group training. Learners are required to achieve a 75% pass mark to successfully complete the course. If necessary, the learner may attempt the test 3 times at no extra cost, having revisited the training material. If learners have not achieved the 75% pass mark, further attempts may be given by contacting Learner Support. 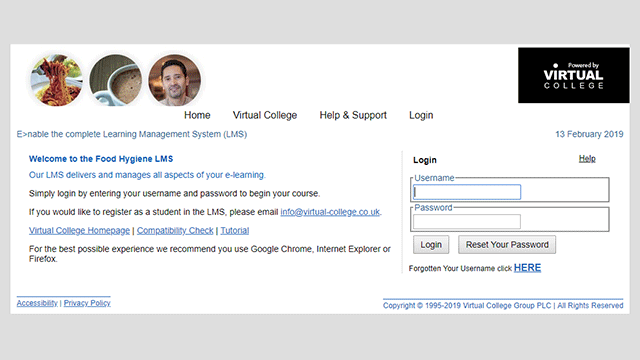 This is a general guide to how the learning management system works. This is an online course, all the training will be taken through your browser window. There will be no face-to-face sessions with instructors nor will you receive any training material through the post. If you wish you may print out any page of the training material and may also print the notes you took during the training. You can also revisit the training material at any time, even after you have completed the course. The material for this course has been broken down into several smaller lessons, each lesson dealing with a specific area of the overall subject. The lesson consists of a series of pages in which an instructor will talk you through the lesson material at a pace that suits you. Pages may also include supporting pictures, graphs, animation or extra sounds to help with the learning where appropriate. 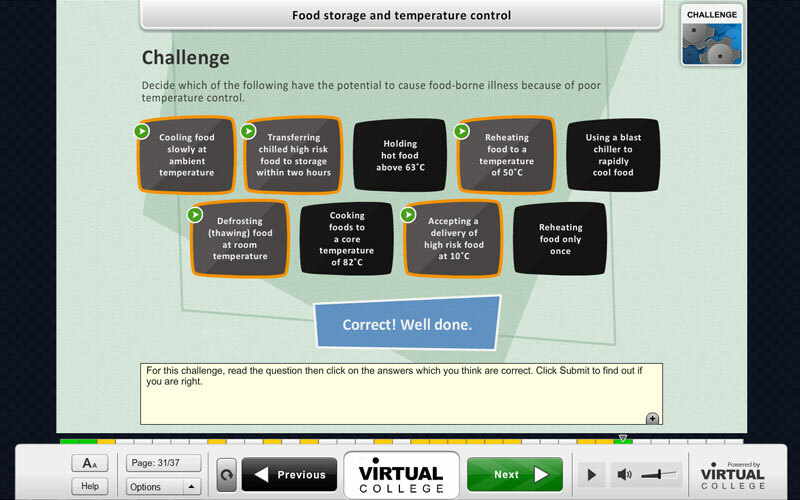 Some lessons will include challenges/quizzes to help you keep in touch and interested in the material. Lessons can be taken in any order and each lesson may be PAUSED and RESUMED at any stage. When all lessons in the course have been completed our system will realise and automatically record that you have successfully completed the course. The course is self-paced so you decide how fast or slow the training goes. You can complete the course in stages revisiting the training at any time, however the training and test usually take between 2 to 3 hours to complete, depending on learning speed. Learners are required to achieve a 75% pass mark to successfully complete the course. If necessary, the learner may attempt the test 3 times at no extra cost, having revisited the training material. If learners have not achieved the 75% pass mark, further attempts may be given by contacting Learner Support.